"The one-of-a-kind kitchen waste eliminator"
Virtually the only exceptions are bulk amounts of food related materials that require a very long time to breakdown, namely: cooking oil/fat and the hard shells of nuts and seafood, such as oysters and crabs. How important is the placement of the Green Cone? 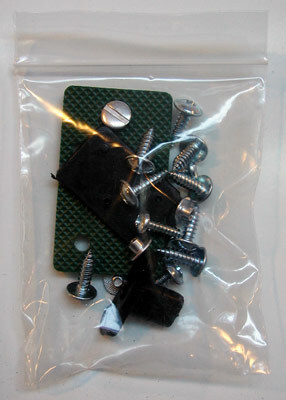 What will I need for assembly? Once the compost fills up, in about 1-2 years, unscrew the top section and remove it, pull out the basket from the ground, and distribute the rich compost that you've made. You may want to stop adding new material a couple of weeks before you empty it to ensure all the scraps inside are fully decomposed. decrease the workload of large-scale treatment plants. No turning. Empty it just once a year. The composting solution for people wanting to compost kitchen scraps but don't want to deal with the regular turning and distributing of compost. Using the Green Cone System, you can eliminate most of your kitchen waste, reducing your family's trash by 20%. The patented design of the unit utilizes a solar heating effect between the inner and outer cones to promote air circulation, which facilitates the growth of beneficial micro-organisms and the desirable aerobic digestion process. The household food waste is converted into water, carbon dioxide and a small amount of residue. Because over 90% of the waste material in the Green Cone is absorbed safely as water by the soil, the Green Cone only needs to be cleaned once every few years when treated with care. Step 1: Fill your Green Cone Caddy with organic kitchen waste. Step 2: For the first week or as needed, shake The Green Cone Accelerator Powder a couple of times over the waste in your Caddy. Step 3: Empty your Caddy into The Green Cone in your garden. BiOWiSH™ Compost Boost assists in maintaining effective composting processes even when you do not strictly control nitrogen to carbon balances in your compost. This makes composting a much easier process where you can dispose of all your organic waste material. 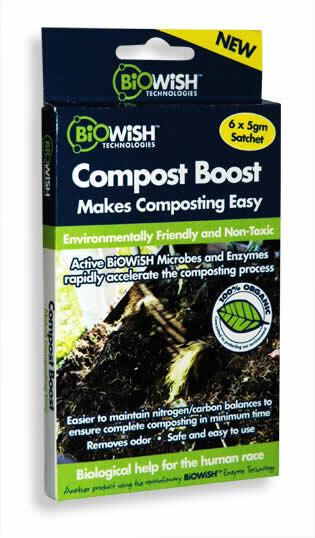 With BiOWiSH™ Compost Boost you are using the most powerful Microbial Enzyme technology available to rapidly digest the waste matter in your composting unit. The Green Cone Kitchen Caddy is a convenient accessory that is kept in your kitchen to reduce the number of trips you make to your Green Cone. Throughout the day, food waste is stored in the caddy before it is taken to your Green Cone. The lid of the caddy contains a replaceable charcoal filter to eliminate any possible odors in your kitchen. 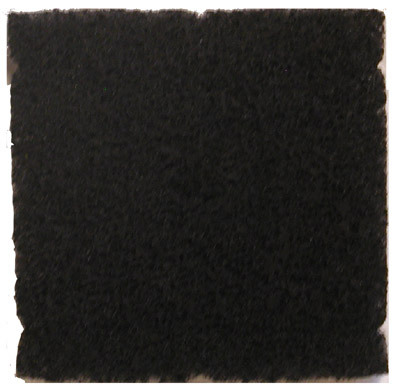 Designed to filter any odors out of your Kitchen Caddy, the charcoal filter is easy to replace. Choose a sunny spot with good drainage. Bury the bottom of your Green Cone about 18 inches below ground. 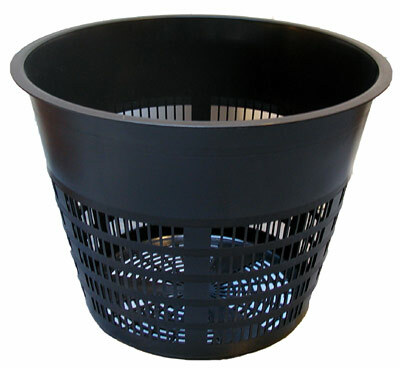 This underground open basket design allows aeration and breakdown of the scraps without smells. Place your cone where it will receive sunlight, the sunnier the better. The top of the cone which remains above ground, is sealed, protecting it from vermin, pets, etc. 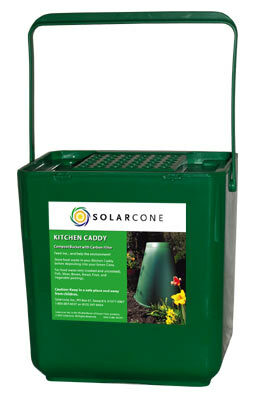 The Green Cone is supplied with a convenient Kitchen Caddy which reduces the number of trips you make to your Green Cone. 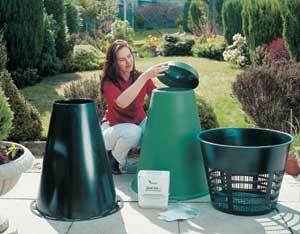 Simply collect your waste in the caddy throughout the day and empty it once into your Green Cone. 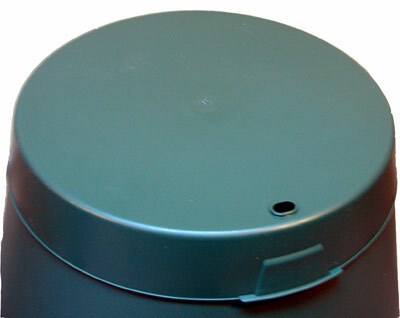 The lid of the caddy contains a filter to reduce food waste smells in your kitchen. Your Green Cone System comes with Accelerator Powder to keep your Green Cone working efficiently. Use this during the first week after installing. There are other times when this powder is useful. For example, when there are long periods of cold weather or when your Green Cone does not enjoy a full day of sunshine. The Green Cone can handle kitchen scraps from the average family of four. That is about 1 full caddy every 1-2 days in the Summer and 1 every 2-3 days in the Winter. After your compost bin fills up, in about 1-2 years, just unscrew the top and remove your basket of compost from the ground.